Everest Refrigeration EPPSR2 59-1/8" Two Section Side Mount Pizza Prep Table - 16 Cu. Ft.
Refrigerated Prep Tables include both pizza prep tables and sandwich/salad prep tables. 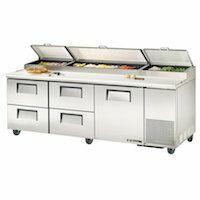 These are essentially undercounter style refrigerated compartments with a item prep and assembly workspace and chilled storage section for food pans of ingredients and condiments on top. A hinged cover can be lowered over the top section to preserve temperatures and product freshness. Prep tables are available in different lengths, so even the smallest pizza parlor or sandwich shop can find the right model to fit their space. Most models have doors for accessing the lower refrigerated compartment, with several models incorporating refrigerated drawers. Refrigerated Prep Tables include both pizza prep tables and sandwich/salad prep tables. These Prep Refrigerators are similar in both form and function. The units are designed to perform at least 2 functions. The lower, under counter, refrigerated compartments are meant to store ingredients that have already been prepped for use in your menu items (pizzas, salads, or sandwiches). Storage capacity will vary depending upon the length of the model, and access to the refrigerated compartments will be by door, drawer, or a combination of both. Both Pizza and Sandwich Salad Prep Tables will keep prepped ingredients at the proper, safe temperatures until ready for use. The second function of the Prep Refrigerators is to provide your kitchen staff with a ingredient prep and item assembly workspace. Typically this is a durable, cutting board type surface that extends the entire length of the refrigerated unit. Some models have an extension of the work surface that sticks out from the unit, providing more space to maneuver and chop ingredients. In addition, most prep units also have a chilled storage section for food pans of prepped ingredients and condiments on top, behind the work space. This creates easy access to toppings and ingredients for fast assembly of pizzas, salads, or sandwiches. A hinged cover can be lowered over the top of the prep unit to maintain proper temperatures and ingredient freshness.